“You’re Jewish, so do you celebrate Independence Day?” When you live in a small town with a small Jewish population, such a question is commonplace. Though the reply may be polite (with an inconspicuous jaw-drop, of course), I really want to scream, “Jews enjoy fireworks, barbecues and a day-off from work like everyone else! We’re Americans too, after all!” Why do people think American Jews don’t celebrate holidays that commemorate American history with dear old Uncle Sam? Perhaps the reason is that when people look back on this country’s founding, they think of names like John, Thomas and James; not Moishe, Dovid, and Shlomo. Jews are thought of as immigrants who came to the United States about 100 years ago with strong ties to Eastern Europe and, eventually, Israel, so what part could they possibly have played back in 1776? As it turns out, Jews were in the thick of the American Revolution. 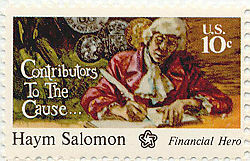 Of the 2.5 million colonists in 1776, the Jewish population in America numbered no more than 2,000. These Jews were mostly Sephardic, of Spanish and Portuguese origin, emigrating from South America, the Caribbean and Western Europe to the American colonies. Despite such small numbers, Jews played an active role in the American cause on a variety of fronts. Financially, Jews like Jonas Philips, who had business connections to their coreligionists in the West Indies, became blockade-runners, jeopardizing their ships to bring goods through the British blockade on American ports. Born an aristocrat, he became a democrat, an Englishman, he cast his lot with America. True to his ancient faith, he gave his life for new hopes of human liberty and understanding. This letter not only set the standard for religious freedom in the fledgling nation, but also solidified Jews as citizens in the newly created United States of America. So, on Independence Day, I will raise my Hebrew National hotdog in the air to commemorate the Jewish patriots who served this country in the American Revolution, who fought for our freedoms and our livelihoods, which include allowing us to live as both proud Jews and Americans. No questions asked. Chinese and Jewish cultures are among the oldest remaining civilizations in the world. Besides the spiritual divide, both cultures highly value family life and educational pursuits, and although both have absorbed various other cultures, their central foundations remain strong. As developments in the Middle East have begun to change the landscape of Israel’s international relationships, China has become a central player for it. While China’s attitude towards Iran’s quest for nuclear weapons are worrisome, efforts are still being made to boost tourism, trade, and communicative cooperation between Israel and China. Most recently, on March 2, visiting Chinese Commerce Minister Chen Deming met with Israeli President Peres and Prime Minister Netanyahu with intentions of enhancing economic cooperation between the two countries. Although Sino-Israeli relations were first officially established as late as 1992, China’s history with people of the Jewish faith dates back to the eighth century. Dr. Pan Guang, Director of the Shanghai Cooperation Organization Studies Center and Dean of the Center of Jewish Studies Shanghai, has developed a recent project, Jews in China: Legends, History, and New Perspectives, which outlines the history of Jewish and Chinese relations, beginning with the four waves of Jewish immigration to China. As early as the eighth century, Jews from the Middle East traveled over the Silk Road to Kaifeng and formed a Kaifeng Jewish Community during the Song Dynasty. 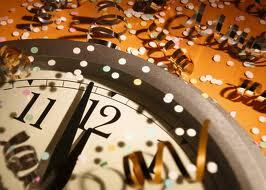 Many became government officials, doctors, clergymen, and businessmen. They assimilated into Chinese culture, learned the language, and began to intermarry. While in China, Jews established a Chinese style synagogue in Kaifeng, influenced by Confucianism but modeled after Jerusalem synagogues. Jews had their own clubs, hospitals, cemeteries, and volunteer corps. Russian Jews had a fur bank in Shanghai, and opened the “Siberian Fur Store.” They founded over fifty newspapers that ran in over eight languages, such as the Israel Messenger (founded in 1904) and the Gelbe Post. The Kadoorie family opened a school for refugee children, free of charge, where many first learned to speak English. Mordechai Olmert, father of the former prime minister of Israel, grew up in Harbin. Most notoriously, China opened its doors to over 30,000 of refugees fleeing from the German occupation after 1938. Not only did Chinese and Jewish cultures share certain core values, but they were also both subject to political persecution. After thousands of Jewish refugees arrived in Shanghai between 1937 and 1941, millions of Shanghai residents themselves became refugees after the Japanese occupation of Shanghai. Nearly 35 million Chinese were killed and wounded by the Japanese fascists during wartime. Chinese were sympathetic towards anti-Semitic suffering. In his lecture, Guang noted that while prejudice may be imported, there has never been any native anti-Semitism on China’s soil. At the core, Chinese are influenced by Confucianism, Buddhism, and Taoism, but they remain accepting of other spiritual aspirations. On a stone monument erected in 1489, Kaifeng Jews wrote: “Our religion and Confucianism differ only in minor details. In mind and deed both respect Heaven’s Way, venerate ancestors, are loyal to sovereigns and ministers, and filial to parents. Both call for harmony with wives and children, respect for rank, and for making friends.” In turn, Jews in China supported the Chinese national-democratic movement against Japanese aggression and many began working with the Chinese Underground. Morris “Two-Gun” Cohen famously acted as aide-de camp to Dr. Sun Yat-sen and rose to be a general in the Chinese Army. Today, Hong Kong, one of the most densely populated areas in the world, contains only 5,000 to 6,000 Jews (Guang argues that newspapers underreport the number at 3,000, excluding those that do not attend synagogue). While many Jews were pressured to leave China during the Cultural Revolution, the impact shared between the two communities stands strong today. Culturally, Jews in China became an academic hot topic during the 1980s and 1990s and subsequently extended to mass media. There is a wealth of Jewish how-to literature as well as a fascination with the Jewish mystique. Some Kaifeng Jews still follow dietary laws that resemble kashrut. Jordan Maseng, a native New Yorker working in China, recently opened up his own bagel shop in Beijing. Guang noted that there are over forty documentaries about Jewish relations in China but a narrative film has yet to be made. With a mixture of jest and sincerity, Guang admitted that he has many ideas but none of them seem good enough, rather adding the assertion, “We want a movie like Schindler’s List.” Until that happens, Chinese Jews will continue to slowly contribute to the culture, while the rest of the Jewish population indulges in Chinese food. Tucked away in the snowy cobblestone streets of Prague’s Jewish Quarter stands a synagogue that is as old and significant as it is beautiful. 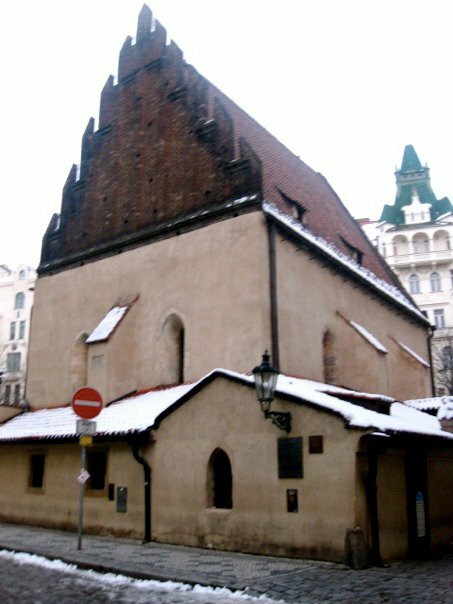 With its high, pointed brown roof and few windows, the Old-New Synagogue maintains old-world style without revealing its true age; built between 1270 and 1280, it is the oldest synagogue still in use in Prague. It defined the Jewish Ghetto, survived the Pogroms and the Holocaust and continues being used today. Embedded in the Shul’s ancient walls lies the history of Prague’s Jews, making it a riveting symbol of the community’s remarkable past. From the beginning, the Old-New Synagogue reflected the troubles of the Jewish community in Prague; hardships and anti-Semitism hindered the process of building the synagogue in ways still visible in its physical structure. Because it was illegal for Jews to hold jobs when the synagogue was built in the 13th century, they had to employ Christians to build their house of worship. As a result, the synagogue’s Gothic style included vaulted ceilings whose beams intersect in “cruciform” (the form of the cross). The Synagogue added an additional beam so the intersecting lines would form something that resembled an asterisk rather that a cross, exemplifying Jewish techniques for complying with the law while remaining true to their Jewish identity. Between the 15th and 16th centuries, the Old-New Synagogue experienced more changes, but this time it was from the community itself rather than from outside. Jewish women, who at the time were not allowed in the all-male congregation, demanded a space to accommodate them for prayer. Architecturally, it would have been impossible to add a balcony or another floor, so an oblong room was built alongside the Synagogue in which the women could watch the sermons through a window. Unfortunately, the delicate Gothic structure would not permit windows large enough for all patrons to get a complete view, so the “windows” more closely resemble holes, about one foot tall and two feel wide, placed at eye-level. To this day, women who attend service at the Old-New Synagogue can be found, faces pressed against the window, prayer book clutched in hand, straining to hear the words of the Rabbi. The dedication of these women, who strictly believe and observe words they strain to hear, provides a fascinating insight to the history of the Jewish women’s movement, demonstrating how the Jewish people have adapted to new ideas, accommodating change yet stay true to their beliefs. In the main room, what appears to be a heavily vaulted chest conceals the true treasures of the synagogue and represents yet another example of the challenges of Prague’s Jewish community. This chest is in fact a locked closet that was created to hide Torah scrolls during Pogroms, a constant reminder of the history of persecution. While the architecture, closet and women’s gallery are all essential to the preservation and adaptation of Prague’s Jewish community, they are not the only protectors of the Jewish people present in Old-New Synagogue; the building was also said to be the home to the mythical Golem, an animated being in Jewish folklore. Rabbi Judah Loew Ben Bezalel, the chief Rabbi of Prague in the late 16th century was said to have created a Golem out of clay from the banks of the Vltava River and brought it to life through rituals and Hebrew incantations to defend the Prague ghetto from anti-Semitic attacks. The legend adds a mythical layer to the already complex and awe-inspiring Synagogue. Though the Golem is rumored to have been driven out of the Shul’s attic during the reconstructions, it is certain that even without it’s mythical protector, the Old-New Synagogue will continue thriving and prospering, much like the community it represents. On the last evening of 2010, a Friday, about 35-40 (mostly) young adults, gathered in a non-descript apartment in the center of Budapest’s—actually on the Pest side of the Danube river—Jewish quarter. This is Budapest’s branch of Moishe House, an organization that maintains 33 houses around the world in which young Jews can gather for Shabbat, holidays, and activities. I spent the last Shabbat of the year at Budapest’s Moishe House, which had become my brother’s Jewish community during his semester abroad. Hungary’s Jewish community has a unique, but tumultuous history. Jews have resided in the Austro-Hungarian empire and in Buda, Obuda, and Pest—the three towns that came together as Hungary’s capital, Budapest, in 1873—since medieval times. As in other European countries, Jews in the region experienced waves of safety and success interspersed with those of discrimination and expulsion. Following the Ottoman conquest of Buda, Jews were dispersed throughout central Hungary and the Balkans, where they lived in relative calm until the Habsburgs, the ruling royal family, imposed new restrictions during their late 17th century reign. In December 1867 Jews were granted full emancipation, and the period that followed was one of prosperity and assimilation of the Jewish community into Hungary. During this time, Hungary’s unique Neolog Jewish movement, which seeks middle-ground religiosity and is most like the American Conservative movement, gained popularity. 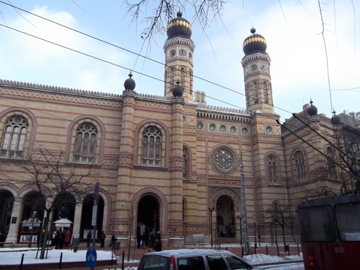 The movement’s majestic and regal synagogue, the Dohany Street Great Synagogue—the largest in Europe and the second largest in the world—hosted major community events and still serves as the emblem and gatekeeper to the city’s famous Jewish quarter behind it. Today Hungary is home to an estimated 100,000 Jews, one of the largest Jewish communities in Europe, and Budapest houses over twenty synagogues and a hip, vibrant Jewish quarter that is familiar to all who live in the city and is actively advertised as a “Must See” in all travel guides. Yet, it also seems hidden and cloaked in mystery. Many of the Jews we met did not even know they were Jewish for most of their lives. Both World War II and the subsequent communism eroded the Hungarian Jewish community and identity. 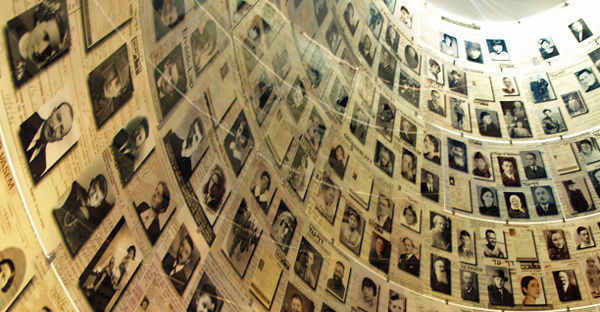 While the discourse has long held that Hungarian Jews perished at the hands of the occupying Nazi German forces, the relatively new Holocaust Memorial Center in Budapest ascribes distinct responsibility to the Hungarian state, arguing that beginning in 1938 the state undertook a process by which it deprived Jews and Roma, in particular, of their “rights, property, freedom, human dignity, and in the end, their very existence.” Budapest’s Jews were confined to the tragic conditions of the Jewish ghetto until their deportation was carried out. Indeed, the deportation of Hungarian Jews was the fastest and most extensive—437,402 Jews from Hungary deported within 56 days—and one-tenth of the Holocaust’s Jewish victims were Hungarian. After the Holocaust’s devastation, the subsequent communist regime turned the remaining Hungarian Jews away from the religion. Many Jewish families were active communists, but even those that were not kept Judaism under wraps. One family friend, now in her late 50s, told us that as a child, most of the families she knew, including her own, were atheists. Once she learned, as an adult, that her family was Jewish, she discovered that all her atheist childhood friends were also, in fact, originally Jewish. Another adult friend shared that as a child he had been told that his grandmother lived in England. He was surprised, when she came to visit, that she did not speak any English and was told that she lived in an area of England that was predominantly Hungarian. As an adult, he, too, learned that he was Jewish and that his grandmother had, in fact, been living in Tel Aviv. Hungarian Jews of all ages shared similar stories. Today, Budapest’s Jews seem caught in a tug-of-war. On one hand, Jewish life and culture seems active, alive, and on the rise, especially among young adults. On the other hand, however, many Hungarians expressed fear about the current government, which has censored the press and includes a faction of members of the nationalist, anti-Semitic, far-right party Jobbik. Many Hungarian Jews I met espoused concern for a future and a desire to make aliyah, especially if the political climate continues as is. Indeed, even as I, a tourist, roamed the colorful and vibrant Jewish neighborhood and visited the impressive—but empty—Holocaust Memorial Center, I could not help but feel that the residual fears of the Holocaust and communism had settled over the city and that the Jewish community was, in fact, one of ghosts.